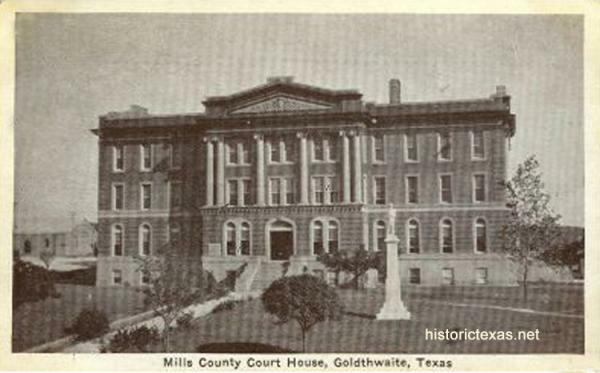 Mills County has been the home of two courthouses, both located in Goldthwaite, the county seat. 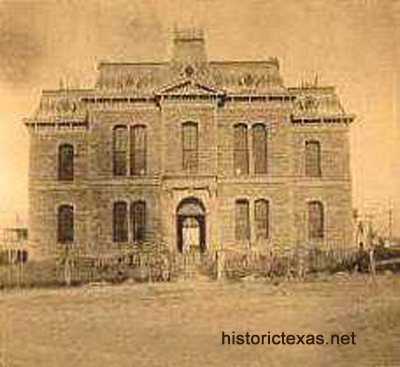 In 1884, F. E. Ruffini received a duplicate set of plans for the Tom Green County Courthouse from his brother, Oscar, who had been hired as superintendent of construction for the new courthouse in San Angelo. F. E. was so taken with the design by W. W. Larmour, that he adapted the form to create his plans for the Blanco County Courthouse in Blanco. The design proved so successful, Ruffini quickly presented the plans to two other counties: Callahan and Concho. After F. E. Ruffini’s death in 1885, Oscar submitted the plans to secure courthouse commissions in Suttonand Mills Counties. 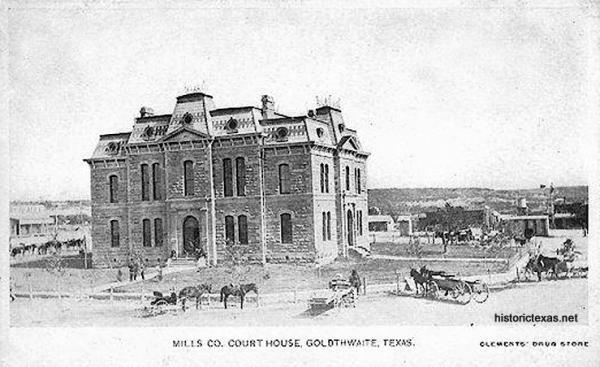 Of the five courthouses constructed using the design, three survive: Blanco, Concho, and Sutton Counties’. The Second Empire styled courthouse was laid out on the traditional cross axial plan with wide corridors dividing the ground floor into four equal quadrants. Offices and storage spaces located in these quadrants were allocated to the County and District Clerks, Sheriff, County Treasurer, Tax Assessor, Surveyor, County Judge and chambers for the Commissioners’ Court. Stairways at either side of the east-west hall rose simply to a graceful curve at the top. The second floor was occupied by an imposingly scaled courtroom and several jury rooms. On the exterior of the two-story stone structure, the walls were constructed with cream-colored ashlar masonry with cut stone quoins and a cut stone stringcourse which separated the two floors and formed a base for the tall narrow window openings. A wide metal cornice was carried on ornamental brackets. Above the cornice rested the mansard roof rising in three sections and featuring framed circular dormers and metal trim which contrasted with the cornice. Mansard pavillions with wrought iron cresting accented the entry bays. At each elevation the entrances were further emphasized by a triangular pediment. The north and south entries were flanked by projecting bays with cornices slightly higher than the adjacent wall surfaces. – From Mills County Courhouse Historic Brief. The courthouse burned on May 5, 1912. Mills County’s second (and current) courthouse is a four story dark brick structure with limestone details including high relief pediment over 2-story Ionic columns supported by brick base accentuated by first floor horizontal banding. Henry T. Phelps was the architect and Gordon-Jones Construction Company, San Antonio, the contractor for the Classic Revival style building. – From Mills County Courthouse Historic Brief.